The integrity risks faced by an organization vary significantly from one type of organization to another. Risks depend in particular on the scope and depth of relations of an organization with customers or other stakeholders. River Basin Organizations (RBOs) face specific integrity risks because of their unique role within the integrated water resources management framework, and their position at the heart of a complex web of basin stakeholders. To assess and address these risks effectively, WIN, cewas and the Brantas River Basin Organization Perum Jasa Tirta-1 (PJT-1) are co-developing an integrity management toolbox for river basin organizations (RBOs). What is an integrity management toolbox and how will it help? This toolbox is a capacity building approach to help organizations assess the integrity risks of their business model and launch a change process to reduce the governance and corruption risks that are affecting their performance on the long term. The toolbox is a practical approach, built with input from organization stakeholders on the risks they face and based on their real experiences and ideas to address these. The integrity management toolbox approach was initially developed to tackle the risks faced by one organization, or a closed system. However, River Basin Organizations, per their nature, depend on and interact with a network of basin stakeholders and the risks they face are often linked to these external interactions. The challenge of the new integrity management toolbox adaptation is to effectively address these external factors while remaining practical and usable for the process owners in the RBO. For the toolbox to be complete and applicable, an assessment of actual risks and possible mitigation instruments is essential. The experience of Kenyan water utilities informed the development of the approach. The integrity management toolbox was then adapted for small and medium enterprises (SMEs) in the water sector based on experiences of SMEs in Zambia and is also being adapted for community-managed water systems based on experiences from Kenya. The experience of PJT-1 in the Brantas River Basin in East Java, Indonesia, is serving as a basis for the adaptation for RBOs. PJT-1 is a state-owned corporate River Basin Organization, active in five river basins on the islands of Java and Sumatra. 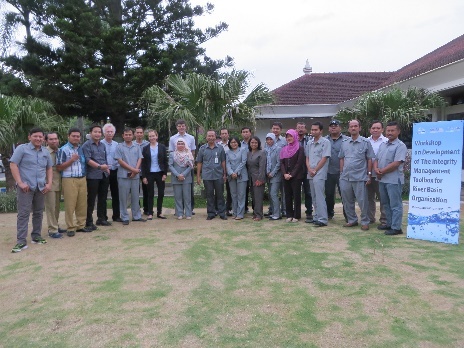 WIN, cewas and PJT-1 held a workshop in Malang, Indonesia, from 20 to 22 April 2015 to identify prevalent integrity risks in the Brantas basin and to assess available integrity-promoting tools. Approximately 40 representatives of PJT-1, public water authorities and NGOs active in the Brantas basin attended the workshop. What kind of integrity risks do RBOs face? 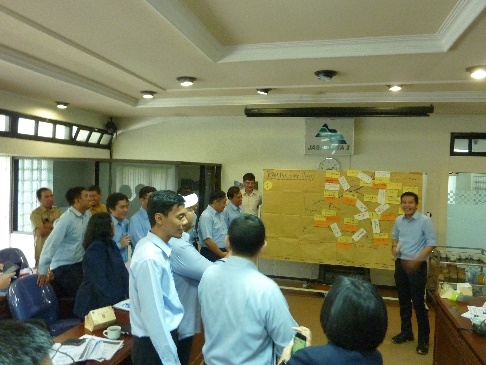 Participants of the Malang workshop developed a network analysis using the TAP risk map methodology to get a first overview of risks. This was done in addition to the standard integrity management toolbox business model analysis. They also performed a brief overview of the legal framework, in light of recent sudden policy changes. The network analysis was particularly helpful in identifying issues related to external stakeholders and interactions with them. Generally, utilities and SMEs face many operational and organizations risks (related to finances, human resources and asset management…). For example, some organizations face risks that contractors perform poorly or collude to inflate prices or secure contracts during procurement processes. Manipulation of documents, misuse of positions of authority, lack of transparency in recruitment are also possible. River Basin Organizations worldwide are equally vulnerable to these risks. In addition, they face a whole set of risks related to their role interacting with numerous, different stakeholders. The network analysis carried out during the Malang workshops helped reveal these risks in the case of PJT-1. PJT-1 has developed a series of own instruments to promote integrity within its organization. These will be assessed in terms of their effectiveness and included in the toolbox where relevant. To tackle the specific relational and external risks that RBOs face, new instruments will also have to be developed. Engaging with external stakeholders early in the process will support this process. All other instruments will then be examined for their effectiveness and relevance for RBOs. Special efforts will also be made to examine how the use of integrity management instruments can be integrated into other management processes such as ISO processes. Finally, the new adaptation will then be tested by PJT-1 in the Brantas River basin. Such a testing phase implies a prioritization of risks, an examination of most relevant instruments and the implementation of these instruments. We’ll publish more information on the process as the testing phase moves along, before sharing the final, tested, new RBO toolbox. Let us know what you think about the process and the instruments that could be used to tackle the main integrity risks in the comments below! We look forward to hearing your views on how integrity can be managed more effectively for River Basin Organizations.